As much as hiking is fun, it can be difficult when the trails are frozen or snowy. In order to enjoy hiking on icy and snowy trails, you definitely need important tools such as the best ice axe and crampons. Crampons help in giving you the grip you need, while an ice axe helps you stop when you slip or are having a dangerous fall. 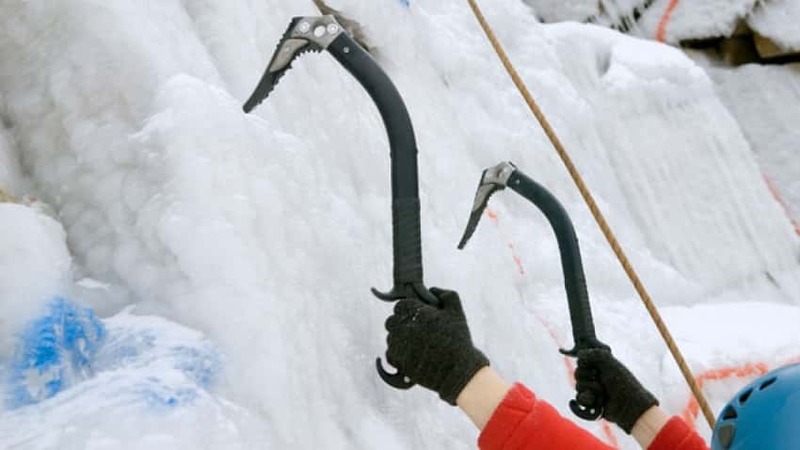 Different ice axes can be used in different situations. However, most axes can be used in almost any situation. Ice axes can be used for glacier travel, hiking and mountaineering and ascending steep slopes. An ice axe has two main components which are the head and the shaft. The shaft acts as the hiking pole, while the head provides the grip. Ice axes are cheaper compared to climbing ice axes although they serve almost the same function. Below is a list of the Top 9 Best Ice Axe that you can select from as you prepare for your snowy adventure. 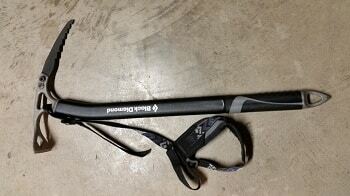 Description: The Black Diamond Raven Mountaineering Ice Axe is durable and lightweight. It is a popular axe with mountaineers and hikers due to its magnificent performance. It has a straight, strong aluminium shaft with a stainless steel head. 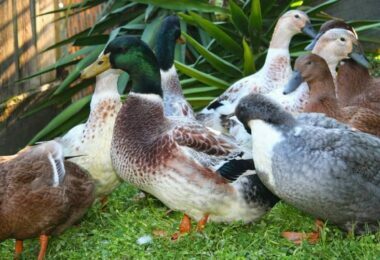 It is comfortable to carry and hold whether you are carrying it in self-bay position or in self- arrest. The head of the axe has a pick that is well designed for self-arresting, an adze and a hole to have a carabiner. The adze is strong enough to cut through the snow and is thus ideal for use in cutting steps as you move forward. The perfect design of the adze also provides comfort while holding the axe at the head. However, it is good to remember that the Black Diamond Raven axe is an ideal ice axe but it has not been designed to climb steep angles. It has a huge clearance angle and a wide pick that diminishes its performance on terrain that is too steep. The adze which is made of stainless steel performs well in digging an anchor, chopping steps, or building a platform. The aluminium shaft, on the other hand, ensures that the axe is light enough for use, with the steel plug ensuring that the axe can plummet into even the hardest snow. Black Diamond Raven Mountaineering Ice Axe can practically be used by anyone since it comes in eight different lengths. 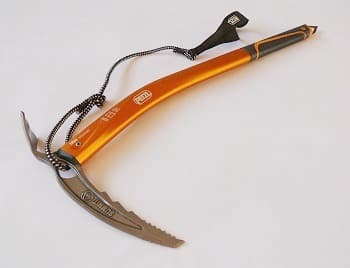 It is durable and lightweight and can be used for hiking, mountaineering, glacier travel and trekking; it is one of the best ice axe in the market. 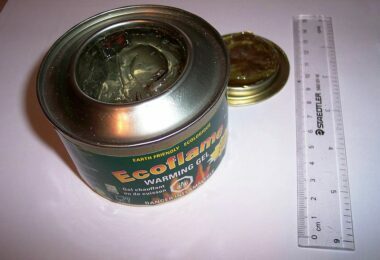 Weight: 425 grams/ 15.0 oz. Description: CAMP USA Neve Ice Axe has a curved adze which provides a comfy hand grip as well as a nice chopping performance. There are carabiner holes at the spike and head making it among the best ice axe. The spike stays symmetrical providing a reliable and smooth plunging. 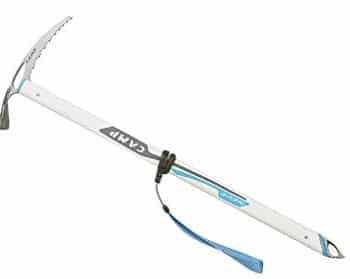 The CAMP USA Neve Ice Axe has a sliding leash as well as a CC4U indicator which informs you as soon as the pick wears past the safe limit. It is an economical, solid axe that can be used to dig rest stances and even on steep glacier. It is ideal for beginners as well as experienced mountaineers. It is ideal for chopping steps, traverses, ice climbing and self-arrests. 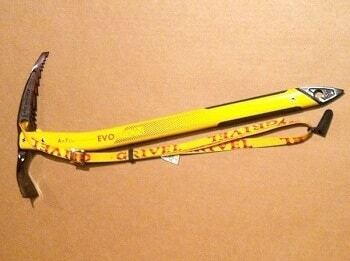 Description: The Grivel G1 Plus Axe is a straight shafted, lightweight ice axe for mountaineering. It has a rubber grip (natural). The hot- forged steel carbon head gives it strength and durability for a permanent bite as well as chopping power. It has an ergonomic head that comfortably fits in your hand while at the same time ascending glaciers and snowfields. The spike is made of carbon steel and thus it easily plunges into hard ice or snow. The shaft which is made up of solid aluminium alloy keeps the Grivel G1 Plus Axe on an ideal weight. It also has a wide, rounded shovel which helps prevent the occurrence of injuries and a pick that is curved negatively perfect for self-arresting. 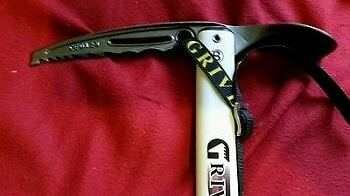 The Grivel G1 Plus Axe is ideal for non-technical mountaineering but it is perfect for high altitude treks. It is lightweight and provides supreme strength. It can be used as an anchor, in a T- slot or as a Deadman. The pick is well designed allowing an easy drive into the snowfall for purposes of self-anchoring. It is important to note that the hole on the G1 does not work well with any carabiner because it is a bit hard to clip. The Grivel G1 Plus Axe has a cool look and is comfortable to carry. It is, however, a little bit expensive but is one of the best ice axes you can get in the market today. Adze: 50, 57 and 64 centimeters. Description: Black Diamond Venom Adze Ice Axe combines the design of a mountaineering axe and the features of a technical ice tool. It has an interchangeable pick in both the adze and hammer models, unlike most ice axes. The adze has a Classic Pick that is traditionally curved while the hammer pick has a reverse curve, namely Tech Pick. These two picks are just perfect. However, the Classic Pick is ideal for self- arresting whereas the Tech Pick is easier to drive in vertical ice. Black Diamond Venom Adze Ice Axe is properly balanced with an ideal head weight that allows the axe to swing easily; it is light. The gap between the head and the adze is minimal allowing a comfy fit. The aluminium shaft is reedy and thus plunges well into the snow, particularly because at the end there are no frills spikes. The rubber grip is comfortable, easy and sticky to grab. It comes with a Lockdown leash which is simple to use and is a very effective tether to be used in the mountains. Black Diamond Venom Adze Ice Axe is CEN-B certified making it one of the best ice axes that you can use in snowy situations. 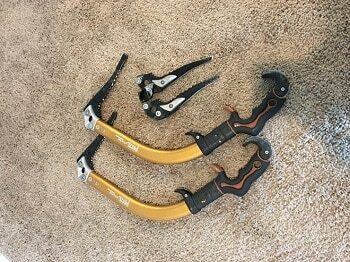 Description: Petzl Summit Evo Ice Axe is ideal for climbing, trekking, hiking, glacier travel, technical mountaineering and general mountaineering. It is ideally designed for technical mountaineering but can be used for all the above-mentioned purposes. It has an aluminium curved shaft and a stainless steel head. The shaft has a rubber grip on the lower side, a hydroformed grip on the curve and a spike at the end allowing snow and ice to penetrate once the axe is held in the head and used for stability. The head has an adze and pick that are made of steel. It is heavier thus providing excellent performance on terrain that is steep. The adze as well provides a comfy grip platform once the axe is held on the head. The pick is wide at the shaft and narrow at the tip; thus is excellent to climb steep slopes and also for self-arrest. It is lightweight but has enough weight on the head for anchoring. The top part of the shaft is curved thus provides a nice clearance as you climb whereas the bottom side guarantees superb snow penetration because it is straight. The spike and the head have holes that allow you to clip a carabiner or attach a sling. 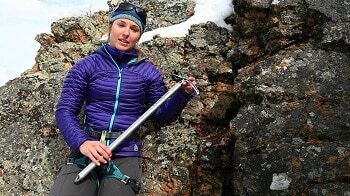 The Petzl Summit Evo Ice Axe is great for mountaineers, recreational hikers and seasoned mountaineers looking for quality best ice axe tools. The price, however, is a bit on the higher side. Description: The GRIVEL Air Tech Evolution Ice Axe has a hot forged head made from a sole piece of steel; it has a mild curve thus provides a solid anchoring and a better clearance. The shafts curve just beneath the head making anchoring easy on any kind of terrain; the lower straight portion of the shaft penetrates into the snow with little or no effort. The GRIVEL Air Tech Evolution Ice Axe has a hand rest that glides on top of the shaft when it is sunk in ice or snow in order for it to support the hand in the grip. The hammer and the axe both have a similar weight. This is one of the most innovative axe technologies. GRIVEL Air Tech Evolution Ice Axe is lightweight, has an attached leash that has a spike protector at the edge and has flush fixed long-lasting spike utilities plunging making it among the best ice axe in the market. 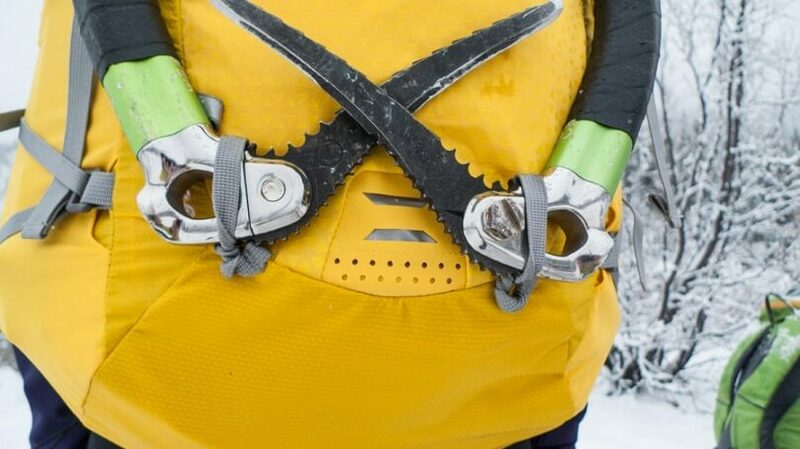 Description: Petzl Ergo Ice Tool is the go-to tool for tough mountaineering situations. It has an ultra-curved shaft that provides remarkable clearance beneath the head & provides a wider range of movement. It has an adjustable ergonomic handle providing numerous grip spots and prevents the danger of pick shift while swapping hands. The handle’s steady curve creates a perfect angle for continued hanging and considerably increases power while pulling. Petzl Ergo Ice Tool has an ergonomically sculpted handle whose length can be adjusted to fit both the hand and glove’s size. The hooking teeth at the top and bottom help to steady the ice axe. The upper handle has a grip tape giving it an enhanced clasp and thermal insulation. The serrated blade, located below the grip rest provides a better hold when you are approaching steep sections in hard ice or snow. The pick weights which allow for better ice penetration can be easily removed to minimize the weight. 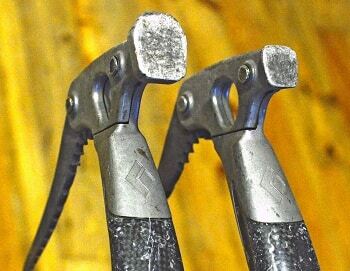 No adze or hammer is included; no sharp thing is likely to hurt your head as you remove a tool, making it one of the best ice axes that you should use. Petzl Ergo Ice Tool has a Type T shaft, comes with a three (3) year guarantee and has CE/UIAA certification. It allows you to climb higher and allows changing hands when hooking easily and swiftly. Description: CASSIN X-ALL MOUNTAIN is a great ice axe for nearly any kind of route. It has a bent shaft that offers clearance over uneven ice features. It has an even swing weight and a strong but thin pick that penetrates any kind of ice no matter how dense and holds tightly on rock features. It fits well in the hand and feels light. It has an interchangeable grip structure that allows you to modify it according to the different climbing styles that you would prefer. It has a spike that is big enough to hold onto glacier that is at a low angle and a hole that is big enough for clipping a carabiner or for attaching lanyards. The enhanced pick angle as well as tooth configuration ascents all ice angles remarkably. You can easily interchange between the hammer and adze comfortably, thanks to the interchangeable head components. There are 3 types of interchangeable grips; leashed & alpine, leash less and snow climbing. The grips are secured on the shaft using one screw; they stifle vibration and shield very well. If you are looking for the best ice axe that is strong and durable, CASSIN X-ALL MOUNTAIN is what you should consider. Hammer Weight: 588 grams/ 1 lb 5 oz. Adze Weight: 617 grams/ 1 lb 6 oz. Description: Cobra Ice Tool by Black Diamond is made using carbon fibre tech that helps absorb vibrations. This axe can practically handle anything. It has a well weighted and even swing. The dampening effect of the fibre shaft softens thus it feels smooth on your shoulders and forearms. Cobra Ice Tool by Black Diamond also does well on minor edges and claps making it the ideal all-rounder. It is ideal for ice routes that are shorter as opposed to longer ones. It has a built-in swivel located on the yoke sling that you attach to the belay loop that holds the tangles in place. It has a Titan Pick (patented CEN-B) that is thick making it strong and durable. The cobra black diamond comes with a cobra strike & Fang. It is lightweight and ideal for climbers looking for the best ice axe. Whether you are hiking on soft or hard ice, it is important that you have the best ice axe with you. Some of the listed ice axe may be a bit expensive but they are definitely worth every single penny that you spend on them. Ensure that you get a strong ice axe for the unforeseen situations that you can encounter while on your adventure. Remember, a good soldier is always prepared and there is nothing like being too prepared. For more safety guidelines, check out our article on winter safety tips to stay protected.